Ethel G. Houghton married Gilroy G. Taylor in circa 1911 age 27 and 27. (?) Houghton married Elizabeth Crawford. Gertrude Houghton married Merle Bernhardt in circa 1924 age 24 and 18. Merle Bernhardt married Gertrude Houghton, daughter of Jesse Lea Houghton and Laura Bell Eggers, in circa 1924 age 24 and 18. Census between 1801 and 1810 Sabra Billings appeared on the census of 18 April 1801 in the household of Dr Elkanah Billings and Joanna Arabella Rogers for Elizabethtown Township, Leeds County, Upper Canada, Canada. Sabra Billings appeared on the census of 1802 in the household of Dr Elkanah Billings and Joanna Arabella Rogers for Elizabethtown Township, Leeds County, Upper Canada, Canada. Sabra Billings appeared on the census of 15 May 1804 in the household of Dr Elkanah Billings and Joanna Arabella Rogers for Elizabethtown Township, Leeds County, Upper Canada, Canada. Sabra Billings was listed in the family of Dr Elkanah Billings in the 1807 Canadian Census for Elizabethtown Township, Leeds County, Upper Canada, Canada. Sabra Billings appeared on the census of 31 March 1808 in the household of Dr Elkanah Billings and Joanna Arabella Rogers for Elizabethtown Township, Leeds County, Upper Canada, Canada. Sabra Billings appeared on the census of 24 May 1810 in the household of Dr Elkanah Billings and Joanna Arabella Rogers for Elizabethtown Township, Leeds County, Upper Canada, Canada. Census between 1861 and 1871 Sabra Billings was listed in the family of Thomas Hunton in the 1861 Canadian Census for Ottawa, Carleton County, Canada West, Canada. 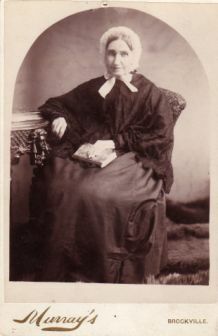 Sabra Billings was Wesleyan Methodist with Thomas Hunton and Amelia Houghton on 14 January 1861 at Ottawa, Carleton County, Canada West, Canada. Sabra Billings was listed as the wife of Luther Houghton in the 1871 Canadian Census for Centre Ward, Brockville, Leeds County, Ontario, Canada. Sabra Billings was listed as the wife of Luther Houghton in the 1881 Canadian Census for Centre Ward, Brockville, Leeds County, Ontario, Canada. Sabra Billings and Luther Houghton were C. Methodist on 4 April 1881. Sabra Billings married Luther Houghton, son of Rufus Houghton and Mary Gleason, in Feb 4, 1821 at St Peter's Church, Brockville, Leeds Co, Ontario, Canada. Grace E. Austin married Ralph Chester Houghton, son of Augustus Emory Houghton and Miss (?) Cole, in circa 1896 age 24 and 20; mar 4 years in 1900 census. Robert Cattermole married Anna Mavor. Fannie L. Moody married Henry L. Moody in circa 1901 age 22 and 19. Henry L. Moody married Fannie L. Moody, daughter of Nathaniel Houghton and Florabel Louise Graves, in circa 1901 age 22 and 19. Doris G. Moody married Bernard W. Sanderson in circa 1934 age 30 and 19. 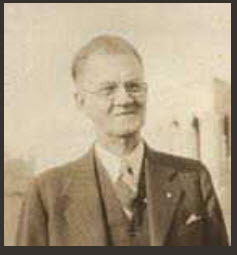 Bernard W. Sanderson married Doris G. Moody, daughter of Henry L. Moody and Fannie L. Moody, in circa 1934 age 30 and 19. Edwin Park Houghton married Alice Maude Gunnell in May 14, 1901 at Genesee Co., MI, USA, age 29 and 22; mar 8 y in 1910 census.